Small vessel cerebrovascular disease (SVCD) can manifest with epileptic seizures and transient ischemic attacks (TIA). This study was designed to test if the extent and spatial distribution of SVCD differs in patients with focal impaired awareness seizures (FIAS) from patients with TIA. This is a retrospective single-center case–control study of elderly patients at a high cardiovascular risk. 118 patients with FIAS (cases) were compared to a matched control group of 118 patients with TIA. The extent and spatial distribution of white matter hyperintensities (WMH) characteristic for SVCD and medial temporal lobe atrophy were analyzed on magnetic resonance imaging (MRI) obtained at admission. The Fazekas, Wahlund, and Scheltens scales were used for grading. Juxtacortical small lesions were analyzed separately. FIAS patients were observed to have more extensive WMH (p < 0.001) and more pronounced medial temporal lobe atrophy (p < 0.001) than TIA patients. WMH in FIAS patients were predominantly localized in supratentorial white matter compared to TIA patients (p < 0.001). Juxtacortical hyperintensities were far more common in FIAS patients than in TIA patients (80.5% vs. 22.0%; p < 0.001). Multivariate analysis revealed juxtacortical small lesions as strong independent predictor (OR, 95% CI 12.8, 6.7–24.3) and medial temporal lobe atrophy as further independent predictor of FIAS (3.1, 1.3–7.1). 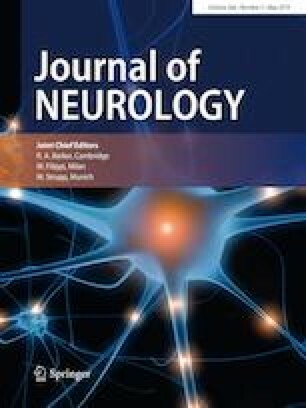 Juxtacortical small lesions and to a smaller extent medial temporal lobe atrophy are associated with epileptic seizures in elderly patients at a high cardiovascular risk. This observation may provide a structural explanation for epilepsy in SVCD. Juxtacortical small lesions in SVCD should be considered a structural cause for epilepsy and promote anticonvulsive therapy after a first seizure. SS analysis and interpretation of data and writing the manuscript. SB acquisition and analysis of data. ACL design of the study and revising the manuscript. JK design of the study and revising the manuscript. HN analysis and interpretation of data, design of the study, and revising the manuscript. The study protocol was approved by the local Ethics Committee of the University of Ulm, Germany.